With a very active 9 month old baby who loves his food, things to snack on are becoming more of a feature in Tom’s diet. 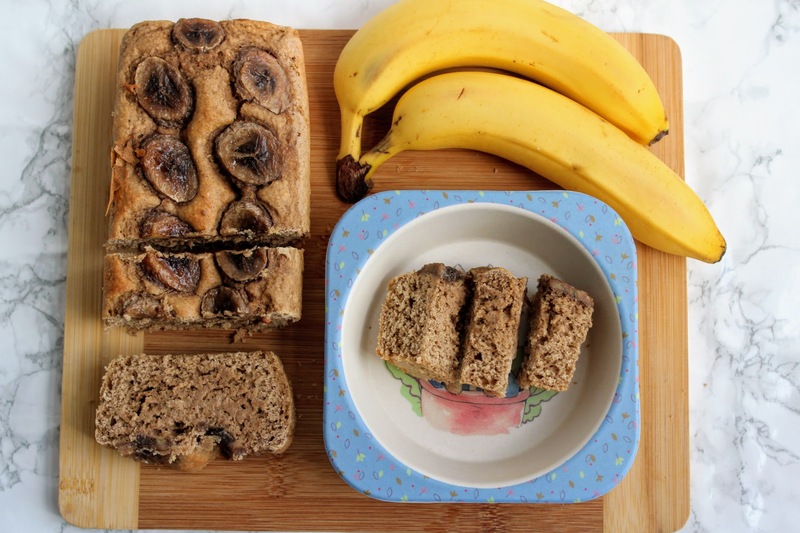 You might have seen a recent post with a healthy oatcake recipe which he’s been loving, but I wanted to step up and make a baby-friendly banana loaf (since he loves bananas so much!). I’m conscious about sugar – it’s surprising how much some baby food and snacks have in it!! – so this recipe simply used the natural sweetness of banana, combined with spices like cinnamon and nutmeg to add flavour. Once it’s baked and cooled, slice up and cut into fingers so your little one can munch on it. Feel free to spread the fingers with a bit of butter or nut butter – Tom loves smooth peanut butter which I recently introduced into his diet, so a thin layer of Pic’s goes down a storm (just like his mum, this is favourite!). Enjoy! Preheat the oven to 180 degrees C and grease and line a loaf tin. Place the banana and coconut oil into a blender (I use my Ninja Kitchen Auto IQ) and whizz up until smooth. Add the eggs and vanilla and whizz again. Add the dry ingredients and blend once more until well combined. Pour into the tin and smooth out evenly. Arrange the banana slices on top in one single layer. Bake for 35 minutes until golden, risen and a skewer comes out clean. Leave to cool then place on a wire rack.